Free shuttle service Wi-Fi and breakfast await our guests at the Americas Best Value Inn Kadoka which is conveniently located about 20 minutes from the beautiful Badlands National Park. Each of the 30 rooms at the two-story Americas Best Value Inn features a work desk cable TV and free Wi-Fi. Non-smoking rooms are available. Stop by the complimentary breakfast to fill up before visiting the Badlands. The 24-hour front desk provides information on the area and airport shuttle service is free. 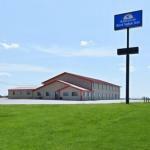 The Americas Best Value Inn is located next to a sit-down restaurant less than a half-mile from I-90 and a five-minute drive from Kadoka Golf Course. Drive five minutes to the Badlands Petrified Gardens or 20 minutes to Badlands National Park. It's two miles to Kadoka Municipal Airport 102 miles to Pierre Regional Airport and 422 miles to Denver International Airport.